Obsessed with home workouts? Our workout equipment bundle is designed to bring the gym right into your home. It's the most affordable, fun, & convenient way for you to get into shape. Click Add to Cart to start your fitness journey. WHAT SIZE IS THE EQUIPMENT? Our resistance bands measure 12" by 2" while our exercise sliders are 7" in diameter. 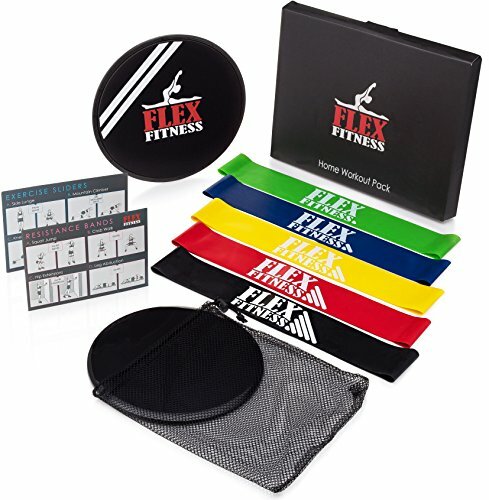 Our Resistance Bands are designed from Superior Quality 100% Eco-Friendly Latex (Non Slip), Exercise Discs are made from durable EVA foam along with High Density Plastic, & our Carry Bag is made using a thin nylon mesh. All the materials that make up our products are handpicked to ensure they are built to last! WHAT MUSCLE GROUPS CAN I TRAIN? Catering for both heavy duty & small quick workouts, our workout gear is perfect for every situation! Make sure you've got your beachbody ready this summer, so grab a pair & start your fitness journey now! ✅GLIDE ON ANY SURFACE~ Our Double-Sided Sliding Discs allow you to utilize your workout sliders wherever you go. Glide across hardwood floors and tiles with ease and never worry about snagging onto carpet. For use on hardwood floors and tiles, place the Slide discs fabric side on the floor. To use on carpet, place the plastic side on the floor and your hands on the padded comfortable side. Perfect for your home gym! If you have any questions about this product by Flex Fitness USA, contact us by completing and submitting the form below. If you are looking for a specif part number, please include it with your message.